As one of the duties of a geology lab instructor, last spring I went on a trip to the St. Francois Mountains in southeast Missouri. These are a range of Precambrian igneous rocks which stand in slight contrast the surrounding sedimentary rocks. These igneous rocks formed around 1.5 billion years ago. In contrast, the surrounding sedimentary rocks are Cambrian in age, around 500 million years old. This results in a large buttress unconformity between the older igneous and younger sedimentary rocks. Both intrusive and extrusive igneous rocks are found throughout the "mountains", which is the remnant of largescale volcanic and intrusive activity. Stop 1: Johnson's Shut-Ins State park. The first stop of the trip was to Johnson's Shut-Ins State Park. This is a popular visitor site in the area, but was closed between 2005 and 2009 due to the Tom Sauk reservoir breaking and flooding the park. The evidence of this flood is still seen near the visitor center in the form of a land scar, with missing trees and large boulders strewn about the field. The scar from the flood due the failing of the hilltop reservoir. The boulders in the field were carried by the floodwaters. Part of the lawsuit winnings against the company that owned the reservoir have gone to current and future part improvements. One of the interesting details of the visitor center was the types of rocks used in the construction, which represent the local geology. Rock types used for the Johnson's Shut-Ins State Park Visitor Center. The purple rocks are the local rhyolite, while the overlying rocks are sedimentary. This shows the contrast between the igneous rocks and the flat-lying sedimentary rocks. Many of the ground tiles around the park are inlaid with interesting rock types. Although these are not local rock types, they are still fun to look at. From the visitor center we walked up to the actual Shut-Ins. Along the way, we were reminded of the dangers posed by the reservoir. 200 steps. No more, no less. The Shut-Ins are a result of the East Fork Black River eroding down through the originally overlying sedimentary layers (which are easily eroded) and eventually hitting the igneous rock below, which is more resistant to erosion. Due to this resistance, a "shut-ins" occurs, or a section of stream which is channeled through a narrow gorge. Topographic map of Johnson Shut-Ins State Park. The East Fork Black River is shut-in, forming a narrow canyon, due to contact with the more resistant igneous rocks. 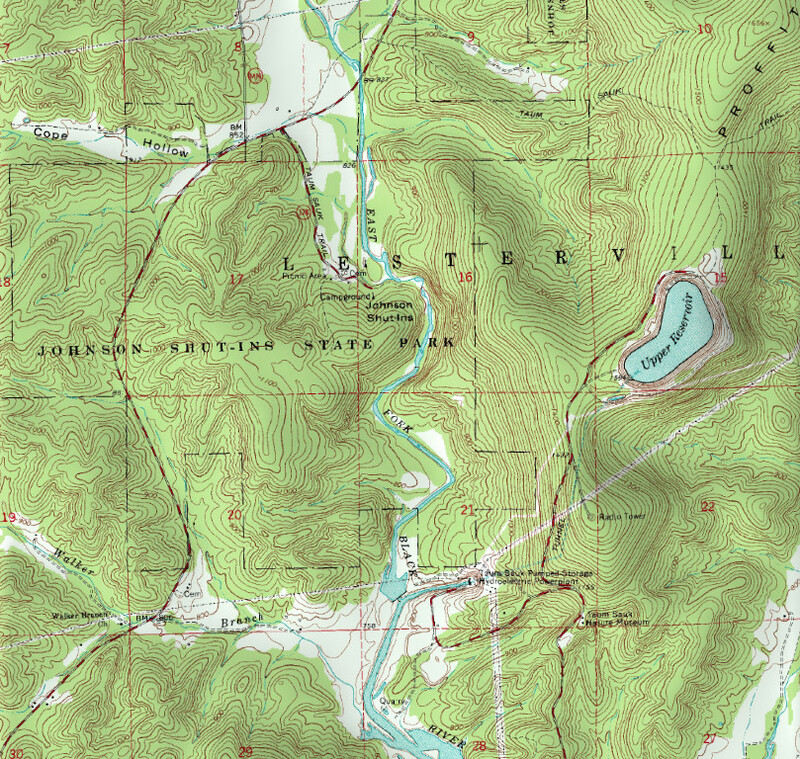 The reservoir is also shown. Rhyolite porphyry make up Johnson's Shut-Ins. This rock type forms during volcanic eruptions. The rocks of Johnson's Shut-Ins are heavily fractured. These fractures are nearly vertical. Water erodes along zones of weakness. For this rock, it is the vertical fractures. The Shut-Ins contains many small falls and riffle pools. Crossing the Shut-Ins, we encountered this cross-bedding in the sedimentary rocks above the rhyolite. The next stop was to visit Elephant Rocks State Park. This park consists of a dome of granite which is heavily fractured. This fracturing is a result of pressure being released from the granitic rocks, which originally cooled deep underground and under high pressures but which are now exposed at the surface. This type of mechanical unloading creates both vertical and horizontal fractures in the rock, perfect for quarrying. This goes to show how much overlying rock has been removed since then. Erosion around the fractures produces large, rounded boulders which supposedly resemble elephants. The rocks formed here are compositionally similar to the rhyolite from Johnson's Shut-Ins, but formed deep underground, as opposed to explosive volcanic processes. This results in a coarser-grained igneous rock, as longer cooling times result in larger crystals. Sitting atop the elephant rocks. The horizontal fracture is due to exfoliation of the granite from pressure unloading. Looking down from the top of Elephant Rocks State Park. The rounded boulders of pink granite were likened to elephants. Strolling atop the pink granite. Quarry pond down down one of the trails at the park. The next stop was to see some ignimbrite, a fine-grained extrusive rock similar to rhyolite. These included very large, very thick exposures of volcanic rock which were the result of very large and very explosive eruptions. Since this was our first stop which wasn't a public park, it was also the first time students got to use a rock hammer (finally, the chance to hit rocks with hammers!). A single layer of ignimbrite, deposited during a single eruption event. Hand sample of the ignimbrite. The next stop was a combined geologic spectacle: a mafic dike through the felsic igneous rocks, and the gap in rock between the igneous rocks and the overlying sedimentary rocks. A mafic dike can be seen sticking almost vertically up through the igneous rocks, up until the overlying sedimentary rocks. On the opposite side of the roadcut, the mafic dike is also seen, and the two can be traced to get an idea of the direction the intrusion spread across. Both the overall igneous rocks and the mafic dike are truncated by the overlying sedimentary rock layer. The erosion of the igneous rocks and deposition of the overlying Lamotte Sandstone creates this 1 billion year gap. The mafic dike is traced to this side of the street. As mafic rocks are more susceptible to erosion than felsic rocks, the mafic dike is eroding away and is seen as a vertical gap in the surrounding felsic igneous rocks. Atop both the dike gap and the felsic igneous rock is the Lamotte Sandstone, which is conglomeritic at the base, as evidenced in the picture. To wrap up what is going on geologically in this region, the next stop was up to Knob Lick Mountain, a lookout over the large caldera which has collapsed due to volcanic activity and pressure release. Scenic overlook from Knob Lick Mountain. This point is along the rim of the caldera, as are the hills in the background. The lowlands are the caldera floor, caused from the collapse of the volcano from volcanic pressure release. On the rim of the caldera. Lowlands in the near background are the caldera. Hills in the background are the continued rim of the caldera. Field hat and hand lens, at the ready! The next stop, the Silver Mines Recreation Area, while also being a camping stop, was also chosen for its geology (of course). Next to this campsite is the St. Francis River and a former silver mine. A hike down to the river brings you across some of the local geology (more granite), but also contains more mafic dikes within the granite. This basalt demonstrates some interesting aspects of how a dike forms and cools, and was also part of a research project and GSA presentation by a fellow student. Dam across the St. Francis River. Silver mine across the river, along with a tailings pile containing lots of fluorescent minerals, along with galena and sphalerite. The mine is normally accessible by walking across the dam, but not during this trip. A group of us hiked through the woods to this pile at night with black lights to hunt for the fluorescent minerals, with mild success. Irregular mafic dike in the granite. A lesson in igneous intrusions within igneous intrusions. Long day of geology = soak your feet in a nice stream atop some granite. Getting dark. Time for dinner, then, hunting for minerals via black light. The final stop of the trip was to check out the Missouri Mines State Historic Site. This is within the Old Lead Belt of Missouri, and constains a museum in an old mine mill complex from the lead mining days. There wasn't much geology to check out, but it was interesting to see and hear about the lead mining which used to occur at this site. Overall a good trip. 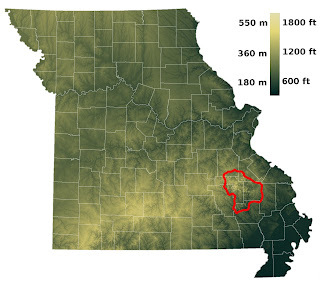 It's nice to see some geology in Missouri which isn't limestone. A good combination of parks (with some information regarding the mining history of Missouri) and interesting field stops to hit some rocks with. Hey there. I am Salsa. My school is organizing a trip to this area. Can I know hot to get Knob Lick mountain? Could you share any papers on the Knob Lick mountain as well? Hope to hear from you. Thanks!